And I'm not talking about the election! I'm talking about changes in my own backyard. And front yard! And everything in between. 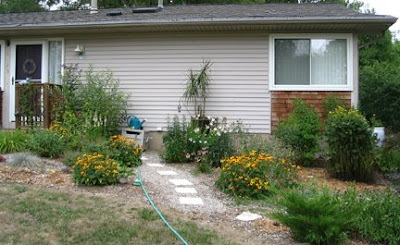 I was inspired by Perennial Garden Lover's post "The Garden in 2006" to track down some of my own old gardening photos. Because a gardener's work is never done (and indeed we don't even view it as work!) it's sometimes hard to see progress in your own garden. Photos really help put it into perspective. 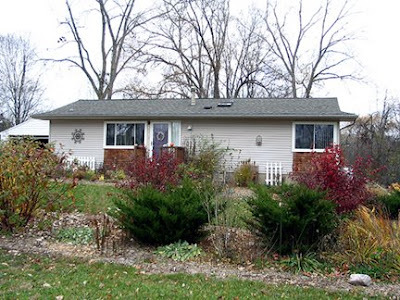 Here is the right side of my house in the fall of 2002, right after I moved in. Gosh it looks bare! I'm so glad I insisted the people who resided the house (it was old, damaged, and dented white aluminum siding before) leave the cedar panels--the only item of visual interest! The only thing growing besides grass were a few hostas, which I moved out back soon after I took this photo. Unfortunately, that huge cottonwood, which was planted waaaay too close to the house, had to be cut down as its roots were getting into my septic system and bits of septic goo were coming up in my basement. Bleck! Here's the same part of my house last fall, in 2007. I didn't think to take a photo of this exact angle this fall as well, until it was too late in the season. It's a shame because I've added so much this last season, both plants and accessories: A weathered teak chair and a small section of white picket fence now add a little friendly home comfort to the view. Note my front door is now purple. Note the path and cute shrubs. Note that it doesn't look as bare! And especially note my rain barrel to the right of the house--I made it myself. 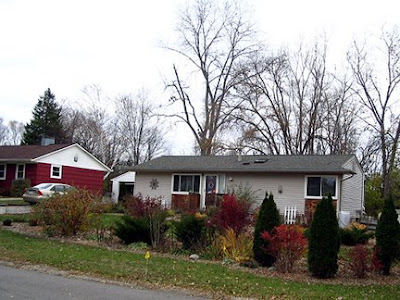 Here is the left side of my house in 2002. Aaaaiee. I know it looks bare, but I bought the house knowing I could do the landscaping myself. The house was built in '66 and the interior had already been updated nicely. Note also all the plants waiting to be planted in their new home. After my divorce I lived almost a year in an apartment, and many of my favorite plants from my old home were stored in friends' yards during that time! Here's the same view from last fall, oh so much nicer. Note the porch railings and the beautiful curving brick pathway (you can see it in the middle of the left side of the photo, lower near the fence panel). And at the left of the house you can see part of a huge privacy trellis a handyman built. In addition the the ever-expanding beds around my house, I also have a very long bed parallel to my house that provides a screen from the road. I started this bed in fall, 2002, with three arborvitae (which were about 4 feet tall), two barberries, and one pyracantha (prickly shrubs and location selected to discourage kids from cutting through my garden but instead using a public park path not ten feet from where they were cutting through). Uggg, see all that green foliage to the right of the photo? That's buckthorn in the park, which I've been cutting back and fighting with ever since. 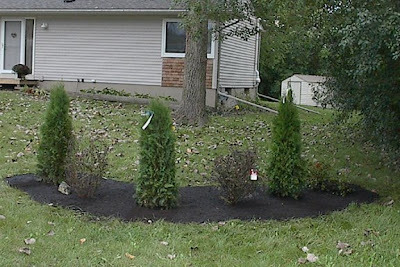 By October, 2007, I had expanded the bed some 30 feet and planted more and more shrubs, and my arborvitae were at least my height (a whopping five feet two!). I just snapped this photo today. The bed has really grown upward and outward and the arborvitae are way taller than me now. (The fire hydrant was removed late last fall as part of street reconstruction, miraculously* without any damage to the dogwood.) Aren't the ninebark cute in their vibrant red coats? Here's another view where you can see the ninebark better, not to mention the purple front door, the picket fencelet, and the chair (mostly hiding behind the obedient plant foliage). I don't have similar comparison photos of my side or back yards, but I'll look for old photos and take equivalent shots next season. Now if you'll excuse me, it's not been raining for a few hours and I have some leaves to rake. Besides, you'd much rather go look at your own garden than stare at mine! *Or possibly because I called the city planners about three times to pleasantly discuss my concerns, including sending them copious photos of the lovely bushes near the hydrant, and to follow up about their construction plans, heh. Amazing what a difference plants make. I'm always surprised that some people are content with grass and nothing else. You garden is looking lovely! Too cute. Your house has really changed and made so much more comfy with the landscaping. I truly love that front bed. What a great spot to garden. Have fun raking those leaves.. Thanks for the link GF! :) Your garden has really grown over the years. I loved the plantings near the curb, what a clever way to keep them kids from using your yard as a shortcut! You have really done alot of work to the front yard and I like the cedar panels. Changes, indeed! And all for the better. 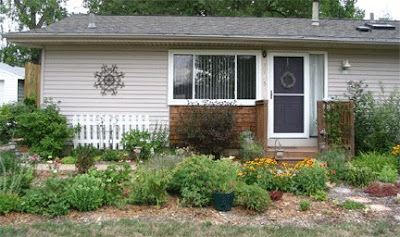 How much more inviting your front looks now, like someone who lives there really cares about their home. The bed near the road is just gorgeous with all those different heights and textures. And I love all your accessories. You can be very proud of all your hard work. looks great Monica! 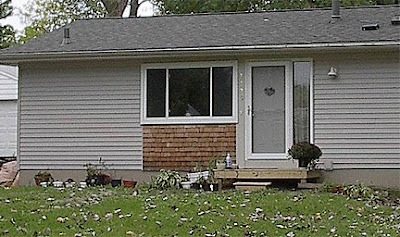 you sure have done a lot of back-breaking work to your front landscape. I love the befores and afters. It's so much fun to see how things have evolved and grown. My house had always been rented up until when I bought it. The person who owned it died and his son inherited it but didn't want to be a landlord. He moved in for almost a year and updated everything inside--the bathroom, kitchen, flooring, etc. So I guess it makes sense tenants wouldn't care about the garden, but it IS true that most of my neighbors, all of whom have owned their houses for years, have mostly lawn. Bleck. I ended up raking some leaves and mowing others--some went into my compost bin, others back onto the lawn. I also found a groundhog hole I fixed up (they're not in there now). Yes, the gardening life is so glamorous! LOL about the cedar panels--the roofer/resider guy really thought they should go but I insisted--afterwards he told me I had been right. 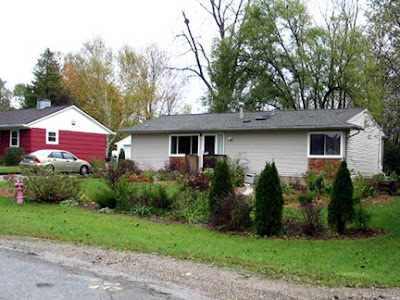 If I could find and post what the house looked like when I bought it--with bad roof and yucky siding, you'd wonder why I even bought it! I certainly never had a vision of how it looks now--it just evolved bit by bit, the way gardens do. You know, it really was back-breaking work, as much as I enjoyed it. I didn't do any of the hardscaping, but every garden item is my doing, and some of those shrubs were heavy to lug (on tarps, though, it's easier!). While I dug holes into the hard hard clay for each shrub, the beds around them were created the lazy way through lasagna layering. My backyard is just as big but mostly shaded, as two sides of it border on the park. I'll post photos next season. It always feel good to come in after working in the garden and I'm happy to have my garden. I bought the house largely for its location! Hi Monica, this is a great example of a determined gardener at work. I love what you did with the shrub border to discourage cut throughs and you plant choices were perfect. Evergreen with some nice reds to liven it up. You can really tell a true gardener lives there. I wanted to tell you about my camera, the Canon power shot A720 IS. It takes a good picture on auto and has a good macro feature, but if I could figure out the manual settings it would work so much better. My vision is terrible and even with the lcd screen I cannot see if a photo is clear or not without loading it on the computer. The instruction manuel is in such small print that I need a magnifying glass along with my readers to even read the thng, much less figure out what they are saying. Way too many steps to do that manual thing. Sigh. I thought I needed a new camera, what I need is an easier camera that takes better photos! Is there such a thing? Nice Nice work!! I'm sure it's been fun for your neighbors to watch your progress, too! Aren't you glad you've been taking photos??? :-) Thanks for visiting me today! The changes are awesome! Your house needed a gardener and what magic you created! Lovely changes to your house! I sent you a URL through email for downloading the guide as a PDF that you can zoom in on. I also shared the auto flash disabler and macro buttons, which are the two manual overrides I most often use and that make me feel like a real photographer. Hooray! And, yes, nature decomposes on her own; the bin just helps her along! 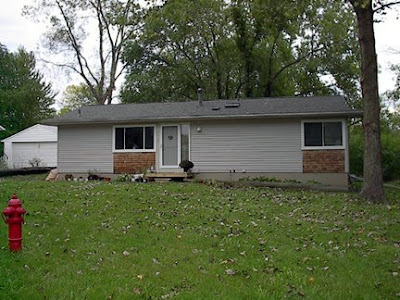 The really odd thing is, the more I stared at the old photos of my house (and they don't even show the whole picture--when I bought the house it had rickety old siding and an even ricketier roof and a crumbling concrete step as the front "porch"! 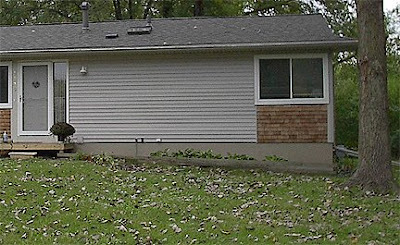 ), I was overcome with the feeling of "Why the heck did I buy that house?!" In fact, it seems so daunting now in retrospect I can't imagine having done it at all! I've always known I was a crazy gardener, but I'm starting to think I may be just plain crazy, as well! It looks great, well done, Monica! BTW love the purple front door. I love to look at before-after pictures. What a change! Good use of shrub border to discourage cut-throughs-innovative, effective and attractive. ;) And it's great to hear you're attacking the buckthorn! Don't you love to see how it changes? Your garden looks lovely too! You've added much charm and interest to your yard since you moved in. I hope in a few years to have similar bare-before and lush-after pictures to show of my new home. Oh my gosh Monica. Your house was naked when you moved in. You have certainly dressed her up beautifully. I bet it was a blast to have a blank canvas to paint as you wanted. You house looks so inviting and cozy all snuggled in with its garden. I hope the children took the hint and quit cutting through your garden to get to where they were going. We had that too. A fence took care of it. I didn't think I would like a fence but I do. We actually put the fence in to keep the dog from going to the neighbors garden to do his daily. UGH...So embarrassing. After seeing your makeover of the front garden makes me want to tackle our front garden. I will when we get our new sidewalk poured. Of course we have been "talking" about it for a couple of years so don't hold your breath. Thanks so much for sending the link. 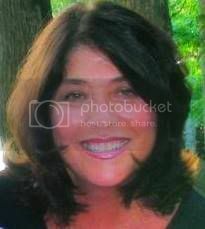 I followed the link you left in a comment on Lisa's blog, and all I can say is 'wow!' You did an amazing transformation. You made it a whole new place, a real home -not a sad looking house. Congratulations!